House was in a great location, only a few minutes walk to Belmont Park. Nancy's vacation rentals were outstanding in their customer service and attention to detail in their check in and check out emails. Our stay was great with two exceptions, the house next door was being remodeled and being woke up every morning to the sounds of hammers and nail guns. I had to work for a few of the morning hours and I just decided to visit the local Kinko's for some quiet. Also you can hear every step made in the other suite in the duplex above you. If not for the remodel next door every other thing about this location and house was worthy of another visit. Our apologies about the inconvenience of noise disturbance from the renovations going on next door. They have completed the project. It is our pleasure to provide five star service to our guests. We invite you back for a future stay. The house itself is decent enough and the location a few steps from the beach is perfect. But the people living in the unit upstairs have babies who made a ton of noise, and we were woken up often by them crying and by the adults moving around. Lots of other visitors in houses very close by partying a lot and making noise. The parking spot is a total nightmare to get in and out of - its really narrow and there is little room to turn into or out of it. The flies from the trash can were terrible - the outside trash can had not been emptied by the time we checked in and there were a zillion flies. We would not stay here again. Thanks for your feedback. My apologies about your experience. I searched our records and I do not see any phone calls or emails about your complaints. We would have been happy to remove the trash but we were not informed about the flies. Summer is a busy time in San Diego and the beach is the most desireable place to be. Parking is close quarters along the coast. We also manage the unit above this rental. The guests staying there were visitors just like your reservation. It is unfortunate that their child disturbed you. We fully disclose that this is the lower unit of a three story house and the parking dimensions. 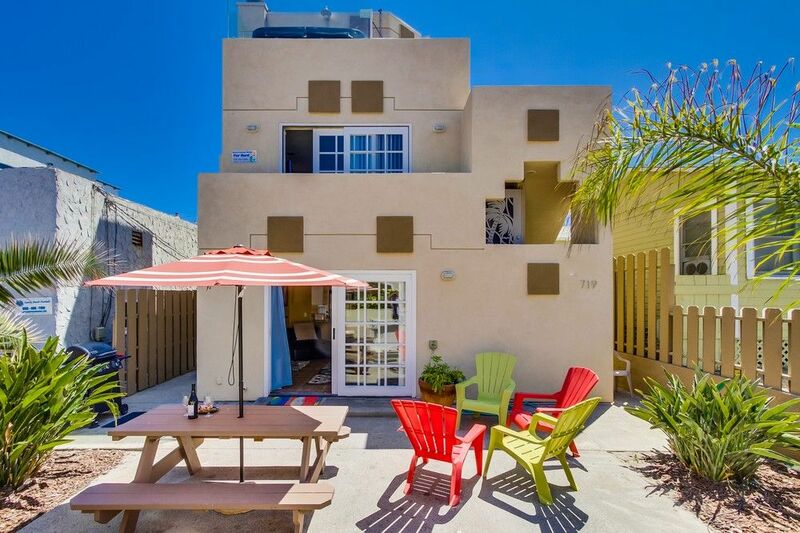 Next time you are in San Diego, I suggest you check out rentals on Mission Bay. The bay is a quieter area and still close to the ocean. We manage properties there as well. We wish you had a better experience. Tired, worn out, and bait & switch. Tired, worn out, dirty, and bait-n-switch is how I would sum up this property. Not wanting to be over critical but this property is definitely deserving of a poor review and a warning to others not to rent. It's time for the property owner to put some money back into the property and pay attention to maintenance and housekeeping. Don't be fooled by the picture gallery. The nice furniture you see inside and on the patio don't exist. The patio has a picnic table badly in need of paint and a couple of dirty mismatched chairs. Not like the photo gallery. The nice furniture shown in the living area is replaced with a single couch that the cushions won't stay in when sat upon. There's a broken, dirty, worn out recliner that doesn't recline and a low back settee in the same shape that should probably have an ottoman. The place looks like it's been furnished from a thrift store. There is a definite lack of attention to cleanliness and maintenance including cobwebs, burned out light bulbs in several fixtures when we arrived, garbage on top of the washer/dryer, dirty stove top, dirty silverware, and dirty insides of kitchen cupboards and drawers. The dishwasher barely washes dishes. Soap dispenser doesn't work. We pulled many rejects from the DW to be washed again. Time for a new one. The washer/dryer are barely functioning. The washer was found full of water when we arrived. No telling how long that had been there. The dryer takes a really long time to dry. The stove has been well used. The top is worn and dirty. The bottom drawer is broken. Kitchen cookware is old and worn. We had to go through and tighten all the handles so they didn't fall off. Kitchen cupboard doors and drawers are out of alignment and loose. Cupboards missing pieces of laminate. Drawers are full of stuff left behind by previous renters besides the dirt. The kitchen sink faucet is so corroded that it will barely swivels. The sliding glass door to the patio practically takes a Mac Truck to open and close. My wife and kids didn't have the strength to operate it. That could be a safety problem if a quick exit is needed. The master bedroom closet cupboards and drawers are in the same shape as the kitchen; broken, loose, and misaligned. Sheets on one of the beds so thin that they ripped. No spare sheets in the house so had to ask for new ones. None of the window blinds throughout are working and all have broken slats. All window coverings need replacing. to address guest issues as they arise. Did you contact our maintenance team upon your arrival to address any of these issues? stay in one of our vacation rentals in the future. First impression, the pictures are nicer than the house in person. Some good - The location was great! Right in the middle of Mission Beach. Close walk to the ocean or the bay, lots of restaurants, the roller coaster, PB, etc. The beds were comfortable. They accommodated our two children by providing highchairs and pack n plays (for a small fee). They also had bikes, lots of beach towels and beach toys, beach umbrellas, and a nice patio to hang out on. Some bad - Things were a little old and run down. The dishwasher and w&d seemed like they might break at any moment. The place didn't have ac, which isn't that big of a deal if you can open windows and use fans. However, the master bedroom has the trash right out the window, so we didn't want to open it. The cleaners weren't out at 4 as promised, yet showed up 10 minutes early on our last day and expected us to be out. The photos look nicer than the house. Stains on the upstairs carpet and comforter. Things were a little old and warn. Overall, if you're ok with the bad I listed, I'd recommend the house. You just want to set your expectations at the appropriate level. removed one star because house was not clean enough (owner did offer to have cleaners come again, but this should have been done b4 check in.